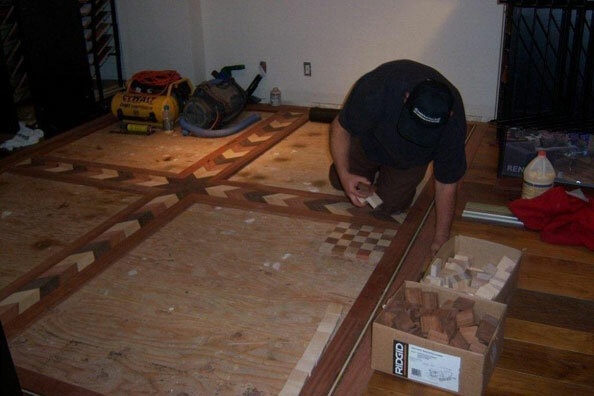 In addition to the use of medallions and feature strips to customize your floors, we have artists on staff that can create one-of-a-kind floors or unique feature strips and medallions using wood, tile and minerals that you select. Some of the wood may come from trees in your own yard. Take a look at our photo gallery, Houzz profile or visit our showroom to see some of the unique projects we’ve done in our 30+ years in business. 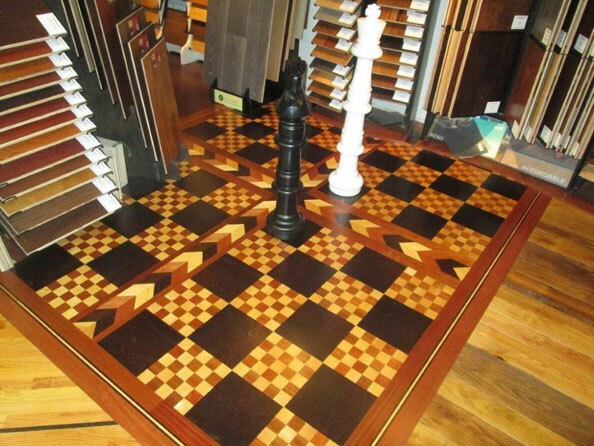 See this Handcrafted Chessboard Floor and 800+ samples of floor coverings at our Campbell showroom. Contact us if you have ideas for your own unique floor. We had lots of leftover exotic woods in our flooring warehouse. 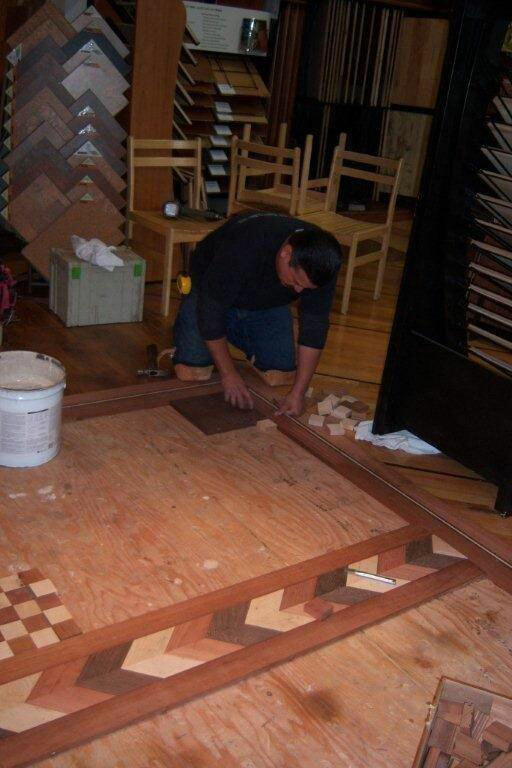 Our flooring artist, Dominic, had the idea to make something out of them. Each piece was individually cut and glued to the subfloor, then sanded and finished. The exotic woods used here are Santos Mahogany, Maple, Wenge, and Brazilian Cherry. Also check out how we crafted our handmade Log Floor & Zebra Floor. Fitting the border and first squares to the subfloor. 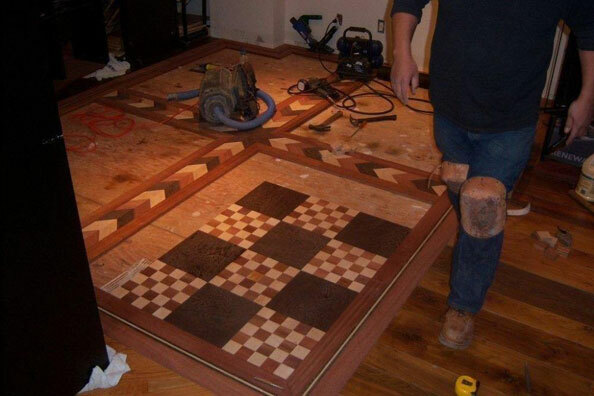 You can see the many small squares used for the floor and how they are arranged on the subfloor. The pieces here are fitting in nicely and 1/4 of the floor is almost done! 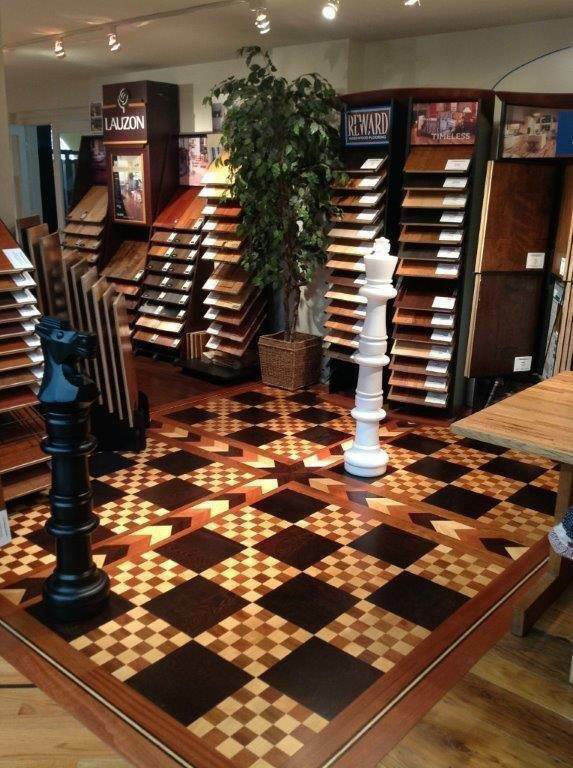 Here is the final floor installed in our main showroom floor!